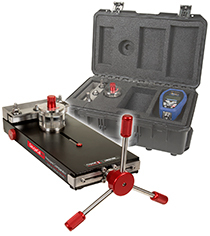 The GaugeCalHP (System G) is a portable, self-contained, hydraulic pressure generator for calibrating pressure gauges, transmitters, sensors, and safety valves. It’s much faster than deadweight testers and most automated pressure controllers; and it’s so quick and easy to use, it’s ideal for calibrating those low cost gauges that are often overlooked for ISO9000 compliance. Use without fluid to generate up to 400 “H2O (995 mbar) to within 0.01 inches (0.025 mbar). Makes calibrating differential pressure transmitters easy. For details on complete pump systems click on the Options tab. XP2i Digital pressure gauge with 0.1% of reading accuracy. It’s a very rugged, intrinsically safe, digital pressure gauge with 0.1% of reading accuracy. 30 Series Wide range pressure calibrator with 0.05% of reading accuracy that fits easily into a shirt pocket. There are no external transducers! Everything is built in!